This post covers how to deal some of the advanced string operations with SAS. In SAS, there are various functions available for handling character strings but sometimes they are not enough to manipulate character strings. Suppose you have a list of customer complaints with their open-ended comments You are asked to analyze it. The most common (or basic) text mining technique is to generate common used words in the list of complaints. It is easily possible via SAS text miner but a little bit complicated to be done via base SAS. The following SAS macro accomplish this task. In the macro, this line of code "where length(var1) > 2" removes all keywords having length less than or equal to 2. It is to remove common non-meaningful words like "a", "an", "be", "is", "am" "of" "on" "in" etc. It does not cover exhaustive list of non-meaningful keywords such as "the" ,"and", "that" etc. 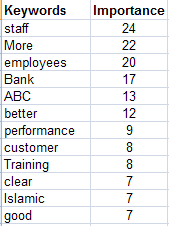 Also, this WHERE condition can remove important keywords that are abbreviations of some department / business unit etc. Example, CA refers to Corporate Agency. So, instead of using this line of code, prepare an exclusion list which can be used to exclude non-meaningful keywords. Suppose you have a list of words. You are asked to reverse it. In SAS, there is a function available for reversing a string. The function is called REVERSE. The LEFT function is used before REVERSE function to remove leading spaces. Suppose you are asked to pull alternate letters from a character string. The logic for it is similar to the REVERSE code. A few changes are : (1) To increment by 2 in loop instead of 1. (2) No sorting letters on descending order. 0 Response to "SAS : Advanced String Manipulation"